Decide if you want professional installation and monitoring or a DIY System. If you want a DIY System – look online for products and systems that best fit your needs and place your order. If you want a professionally installed system – do you want it to be a package or fully customized to you? Many cable companies offer package security systems nowadays. Decide whether you want a local company or nationwide. Deciding factors should include products, customer service and monitoring. Get multiple quotes. 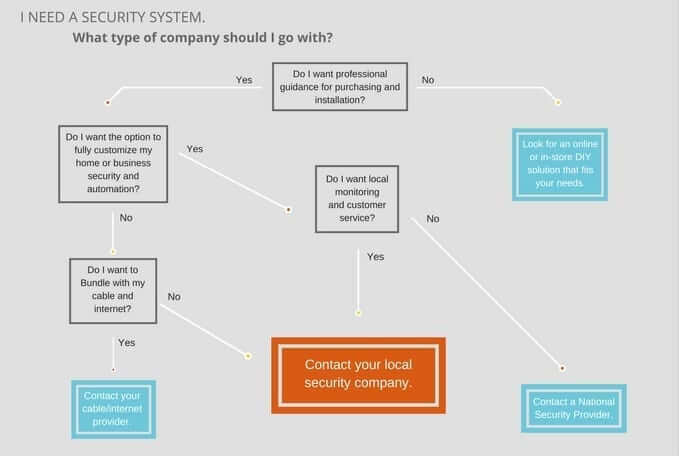 The only way you will know for sure which company you want to go with is if you receive in-home security quotes from multiple types of alarm companies. A quick online search will show you many different security providers, but not every company is alike! Different providers will give you completely different experiences – not just while purchasing and installing your system, but in customer service and monitoring as well. Keep reading for a couple tips to determine which provider is right for you. Do you want a professionally installed or DIY system? Some people love a good DIY project. If this describes you, there are many online and in-store options that will allow you to buy and install the products yourself. But, keep in mind that this often will not provide any actual monitoring for your alarm. This can often mean that even though your alarm system is going off – the police may not respond to your alarm. If you aren’t into the DIY process, you will want to go with a security company that will provide sales guidance and do the installation for you. Do you want the option of full customization for security and home automation? Most cable/internet providers provide a package deal for products offered and cost. If customizing your security isn’t important to you and you want the option to bundle with your cable or internet; contact your cable/internet provider. How much value do you place on customer service and local monitoring? National security companies are large, corporate companies spread across the country. Therefore, they cannot provide you with true local monitoring or customer service. However, just because a security company is local, doesn’t mean their monitoring is done locally. Some smaller security companies outsource their alarm monitoring to a third party. There are local security companies that do their monitoring in house. These companies have the ability to to monitor their own alarm accounts. One of the major benefits of in house monitoring is better customer service. The dispatchers become familiar with home owners and businesses. Because of this, they are able to provide a more personalized customer service experience. If this is the customer service experience you want, go with a local security company that provides in-house alarm monitoring. Most companies offer free in-home quotes to assess what you want in a security system as well as what will work best for your budget and property. This is the best way to get a feel for the companies’ customer service and to address any questions you may have. Getting more than one quote will give you an idea of price and compatibility to ensure you are picking the right security company for you! We hope this was helpful in your decision making process! Let us know in the comments.